Aesthetics ( How does it look? ) – We want a functional bird table that performs the job desired, but we also want it to look good – right! Material – They are usually made of wood, but an increasing variety of metal, plastic and polycarbonate tables and feeding trays have become available in recent years. Although less appealing to the eye, they are easier to keep clean. The post – The smoother and straighter the post, the harder it is for cats and the dreaded squirrels to climb. Rustic ones with knobbles should be avoided. Make sure that your bird table is cleaned regularly and never allow old food to accumulate as bacteria left by sick birds can start an outbreak of disease. Scrub the table with a mild disinfectant solution every few weeks and move the table from time to time to stop the accumulation of droppings underneath. The Fordwich bird table, produced by The Hutch company, is hand built from sustainable low carbon FSC timber, so you can pride yourself in doing your bit for the environment if you purchase this product. It is a short table – just about five-feet tall – but has an adequately sized table. Its height gives the optimal viewing angle when the viewer is seated. An anti-pigeon and anti-cat design should allow the birds free reign. Purchasers of this product note how easy it is to assemble and clean but that squirrels can obtain access to it if not larger birds like pigeons. It is an attractive bird table in the medium price range. This table is manufactured by Riverside Woodcraft and is in the premium price range with its triple platform feeding arrangement. It is a large bird table coming in at nearly six-feet tall with an upper feed tray of 4 sq ft. It has 2 lower feeding trays and is very chunkily built with a robust 3-inch thick post. This is a more expensive bird table, the extra cost probably being due to the slate roof and spooky gothic design. This table arrives in 2 boxes with the roof fully assembled. 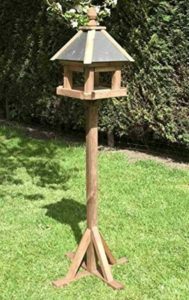 The Rowlinson Laverton design bird table measures nearly six-feet tall and has a very elegant four-sided slate hip roof. On its roof, it sports a huge fashionable knob and the whole structure is very strong and stable, weighing slightly more than 10kg. The feeding tray is towards the smaller size ( around 1.5 sq ft ) and its cost is nudging the upper end of the market, but it is quite remarkable in that virtually no buyers of this table are disappointed in their purchase – so, how can you go wrong with this item. This garden bird table from The Hutch Company is at the low end of the market as far as cost is concerned. It is chunkily built with a solid 3-inch thick post, is five-feet tall and has a pretty large feeding tray. The whole thing can be put together pretty easily within about half an hour, but the wood quality is not the best. Still, what can you expect from a product that is so cheap? The Tom Chambers Dovesdale Slate Roofed Bird Table is a very grand table indeed and one of the best-sellers. Standing six-feet tall it has an attractive hexagonal shaped roof made of genuine slate. This stunning design will give your garden a real splendrous focal point. It is of wonderful quality, strong and sturdy, as nearly all purchasers of this product agree, but it is at the more expensive end of the market. One drawback pointed out by some buyers, is that the feed tray has no gaps in its corners to clean out old bird food. The Tom Chambers table can be used in conjunction with the Bird Table accessory set which allows a feeder to be hung from your table along with a seed tray and water dish.